The War Department [has] become a business affair. He cited the aircraft work of the army as an example. “A year ago,” said Mr. Crowell, “there were eleven officers, all strictly military men, and about 1,000 privates in the aircraft work. Now in that branch of the war business we have thousands of officers and 100,000 men. But 96 per cent. of those officers are trained business men and engineers from big civil enterprises. Most of them are in military uniform, but that is merely a matter of form that does not go to the substance of the business. President Trump spent the past few weeks ratcheting up his trade wars, which he claims would be “easy to win.” He has implemented tariffs on steel and uranium, in a move that even many or most of his own party’s Congress members oppose, not to mention most other world leaders. That doesn’t necessarily mean it’s wrong, and indeed America’s $566 billion trade deficit in 2017 was the highest since 2008. No nation can allow another nation to impose law upon it, and no formula for international law can be agreed upon. Under our laws a man is entitled to trial before a jury of his peers. There can be no such jury in international cases. The case starts with prejudices, which never were so strong as now. The world is in hostile camps, and there are those who would like to see business done under systems of boycott or economically hostile organizations. This war must have an end, but a war of boycott would run interminably, with loss for all and benefit to none. A conflict that was peacefully adjusting itself before the war has been churned into fresh fury. It is the ancient contest between male and female labor. Most often silent, it now threatens to become vitriolic. Many regard it as the powder magazine of the present labor world, one that an unforeseen match may explode into a national calamity. Only those with an ear close to the ground hear the rumblings of the coming storm. The restraints of patriotic appeal have held in leash an ever-mounting resentment in the ranks of labor, organized and unorganized, and as yet this has found only a superficial expression. But there exist signposts which point the easy road to trouble. Is it true that America, like Europe, is to have feminized industry? If so, will man resign his present place without a fight? If he does fight, what form will the contest take? Will America have feminized industry? As of December 2017, the official male unemployment rate was 4.0% while the female rate was a bit lower at 3.8%. (The “full” unemployment rate is usually about twice the “official” rate.) So women had a better rate of finding jobs than men. Will man resign his present place without a fight? If he does fight, what form will the contest take? Man hasn’t “resigned” his place in any meaningful sense — it’s not like everything is run by women. But men have definitely put up a fight. Read the New York Times’ thorough expose Harvey Weinstein’s Complicity Machine if you doubt it. 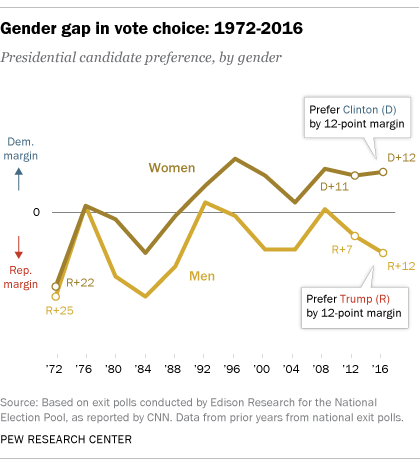 2016 also saw the biggest gender gap in presidential voting ever, with a 24 point differential between men voting for Trump and against a potential first female president by +12, while women voted for Clinton by a reverse +12. Between 1861 and 1863, the Civil War caused huge percentage price jumps. Eggs went from 15 to 25 cents per dozen, cheese from 8 to 18 cents per pound, and a bushel of potatoes from $1.50 to $2.25. But if the prices were actually lower than they were in 1918, why was there so much more economic anger about prices during the Civil War than during World War I? Because during the Civil War, income and wages were doing a much worse job at keeping pace with inflation. Ostensibly the lesson here for the present day would be that politicians should try their best to insure that wages go up. Yet in 2016, American middle-class incomes reached their highest levels ever, yet the presidential election reflected seemingly the opposite result. Among the jobs which were women were filling in for men in larger numbers as a result of World War I: streetcar conductors, subway guards, elevator runners, firefighters, munition works, the felt hat industry, radium plating, and wagon drivers. As a man, I would gladly volunteer for even the most unjust war to avoid an occupation of radium plating. Guess how Marie Curie died? “In fact, the last week has been about the worst week in the history of the American theater.” That was the worry gripping Broadway in December 1917. What was causing this? Other explanations offered included a wartime tax on theater tickets, and the fact that war started to become more “real” for Americans outside of combat round October due to several factors such as a sugar shortage, even though America had entered the conflict in April. In November 1917, the prices of most stocks were between 20 and 70 percent below where they had stood a year before. The plummet was so steep that rumors abounded that the Stock Exchange would be entirely shut down, permanently. 1.) The demands of the Liberty Loan. Every one [sic] has subscribed or has pledged to subscribe about all the spare cash he can must for the coming few months. 2.) The collateral demands of the war, the Red Cross, the hundred and one charities which reach forth on every hand to waylay the pocketbook. 3.) The vast needs for new and quick industrial investments to meet the munition and supply demands of the war. 4.) The uncertainty of the immediate future. Those who have available cash hesitate to invest it in stocks or bonds, even at the present ridiculously low prices. They would rather wait a bit and see what the Winter brings forth. The market eventually self-corrected. In fact, if you had invested $1,000 in Coca-Cola stock during its original 1919 initial public offering, two years after this article was published, that stock would be worth $9.8 million today. A century later in 2017, the opposite question is being asked: why does the stock market keep going up? Derek Thompson of The Atlantic recently wrote an excellent article analyzing this question after the Dow reached a new record high. 1. It’s simple: Corporations everywhere are making a bunch of money. 2. A1 chaos doesn’t drive the business cycle. 3. There aren’t many obvious signs of bubbles, or causes for imminent corrections. Thompson’s reason #2 in particular on its face may seem to contradict Roberts in 1917, since Roberts’ theory was that the page-A1 chaos of the time — namely World War I — was exactly what was driving the business cycle. Then again, WWI truly consumed everything about the economy, politics, culture, and life. By contrast, Trump’s headline-driving tweet of the day usually generates more of a “Wasn’t that interesting?” response (or “Wasn’t that terrifying?” depending on who you ask) rather than proving transformative to the markets. Usually… but not always. After Trump tweeted attacking their respective companies, Amazon’s stock market value dropped $5 billion, Boeing dropped $550 million, and Toyota lost $1.2 billion in five minutes. Princeton University, however, is legally not the Faculty and students, the community citizenship, but a group of twenty-nine men in no way responsible to them, and none of whom lives or functions at the university. These twenty-nine men at Princeton, and other small groups like them in every college and university community, are in law rulers whose power is absolute. They have the legal authority to employ and dismiss whomsoever they wish in the service of their institution — the President, the professors, administrative officers, janitors, and day laborers. And no one of these, it is well to note, has any more constitutional security of tenure than another. They can discharge a janitor who complains that his wages are low, or an instructor who makes the fact known to his classes. That Trustees and Regents to not exercise in practice every one of the powers granted to them by law is proof not of any lack of authority, but merely a lack of desire to do so. Charlie Chaplin, Mary Pickford, and Douglas Fairbanks were earning a then- staggering $1 million per year in 1917. $1 million in May 1917 would be worth $17.5 million today. How does that compare to the highest-grossing movie stars now? That would only make Chaplin the 24th-highest paid movie star in the world last year. Forbes ranked Dwayne Johnson as the highest-paid actor of 2016 at $67.5 million. Chaplin would be sandwiched between Matthew McConaughey at #23 with $18 million and Chinese film star Chan Bingbing with $17 million. The most expensive New York City apartment in 1907 was $6,000. A decade later, in 1917, it had quintupled to $30,000. Those were the days. By 2017, the most expensive NYC apartment cost $100.5 million — and even that could be shattered by an estimated rumored $250 million apartment that’s currently under construction. The total amount of gold in 1917 was about $3.08 billion. Today that’s more than tripled to $11.04 billion, according to the Treasury Department. About 56 percent of that is held in the famed and heavily-guarded Fort Knox location in Kentucky. The U.S. has had a long and complicated relationship with gold. American money used to be backed up by a gold standard since 1879, until President Franklin D. Roosevelt largely took the country off it in 1933. We were formally and fully taken off the gold standard by President Richard Nixon in 1971, and some critics such as former U.S. Rep. Ron Paul criticize this decision as being one of the key factors in subsequent inflation and the Great Recession of 2008-09. In 1917, the average worker lost nine days annually due to illness, according to Frederic W. Loughran, then medical adviser to the New York State Insurance Fund. In 2013, the average worker only called in sick 4.9 days per year. This even though the average full-time private sector employee had eight paid sick days off. Between 1908 and 1916, the total value of U.S. peanuts more than quadrupled. Why? Because the cotton crop had been nearly wiped out boll weevils, leaving far more land for peanuts to be planted. As a result, the price per peanut bushel had doubled or more within only a few years. The more you know. The final sentence’s prediction that “Down in the cotton country they are saying that we are soon to see the rise of peanut barons” never quite came true, as best I can tell from quick research. “Suppose, for instance, that you had about 65,000 men, the great majority of them young, healthy, and hungry, to clothe and feed. Suppose that when you bought flour you bought it by the millions of pounds; that you meat purchases totaled nearly 18,000,000 pounds a year; that you had to buy almost 25,000,000 pounds of cabbages, onions, potatoes, carrots, cauliflowers, and other fresh vegetables annually; that your sugar and coffee and canned good purchases were proportionately large; that when you bought eggs the order specified a few hundred thousand; that you bought every twelve months more than 1,700,000 pounds of butter, not to mention scores of other foods which America’s bluejackets and marines must have and do get, what would you do about it? That was in 1917. If anything, today those numbers for the Navy are almost certainly larger. I couldn’t find numbers related to the cost of food for today’s military, but the number of active duty Navy members currently stands at 323 thousand. A few months ago I covered a talk from Secretary of the Navy Ray Mabus, yet somehow this subject of food never came up. Ah, the days when “the most famous hotel man in the world” didn’t inherit the business from his father, but achieved his status through grit and determination after starting in the kitchen.